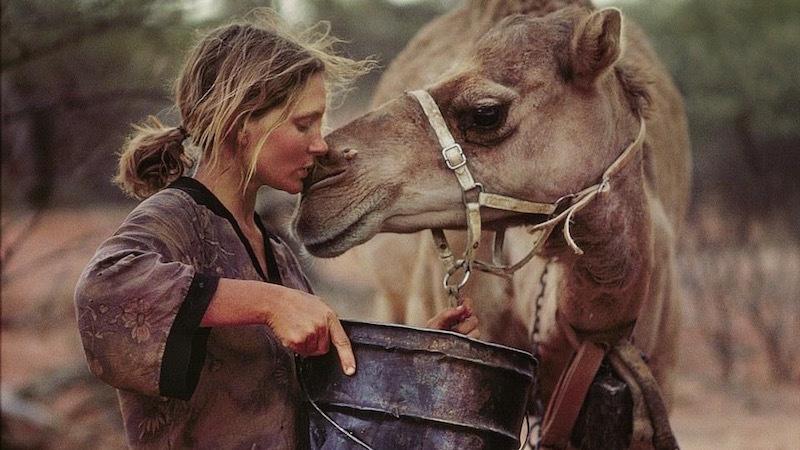 In 1984, when I was 12 years old, I read Tracks by Robyn Davidson about her 2,700km solo camel trek from Alice Springs to the west coast of Australia. A trek of this size, across a vast desert, undertaken by a woman alone had never been heard of before in Australia. Now Robyn’s journey stands as testament to the limitless potential we all have if we believe in ourselves. I am a prolific adventure reader but this book resonated deep in my heart. I was still a kid but half way through the book I knew I would do something like that too. No book has impacted my life more than Tracks. There were many valuable lessons in her adventure but what hooked me in more than anything else was the freedom found in solitude when fully immersed in Wilderness without another human within hundreds of kilometres. It isn’t a romantic ideal because Robyn made it clear that this kind of freedom doesn’t come easy, it comes with blisters, burns, confrontations, fatigue and letting go of everything. Our dreams are only limited by our willingness to do whatever it takes to achieve them. This was my first Tracks lesson as a young adventurer, the greatest things in life require hard work, perseverance and sacrificing comfort. From this vantage point, after nearly 22,000kms of solo walking through Nature and Wilderness, I think this was also the most important lesson. At the time I did not recognised it as a lesson, I subconsciously absorbed everything Robyn wrote and carried it with me throughout my years of adventure. Through her story I instinctively knew life was not going to be easy and the biggest goals and rewards of any adventurer also bring the most hardship and risk. The next important lesson I carried with me was the importance of solitude in Nature. I was already a quiet, shy kid and preferred being alone in the bush or in the company of other animals. My own reclusive tendencies have been clinically diagnosed as social anxiety and autism. Solitude in Nature was my solace, sanctuary, safety as a teenager and still is now. The way Robyn wrote about the feelings of being alone in the desert hit such an harmonious chord I knew I had met a kindred spirit in the pages of her story. Even a 12yo girl knows when she has met one of her tribe. I often thought about Robyn walking across the desert as I walked around Australia alone and understood some of what she felt out there traversing untracked outback wilderness. It always feels good. Dream big dreams and don’t let anyone or anything stop you from following them. In the well of wisdom, that is Tracks, is this spring of knowledge. I have much to thank Robyn for, especially this. I can’t remember many of my life plans before reading this book but I have always had a reputation of setting myself seemingly impossible and danger fraught goals. Even if I have not hit every target and completed every crazy adventure I set out on I have achieved far more in my life than most people even dream of. Not least walking nearly 16,000kms alone around Australia inspired by Robyn Davidson, one of the world’s greatest Adventure Women. Thank you Robyn for not letting anyone or anything stop you. Thank you for being a strong, intuitive role model. All images are embedded from Rick Smolan’s National Geographic collection in Getty Images taken during Robyn’s trek across Australia. Please click each image for the original and more beautiful photos.